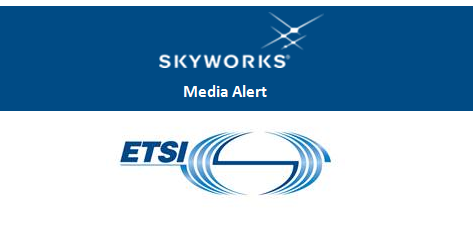 Skyworks Solutions is pleased to announce that it has become a member of ETSI, the European Telecommunications Standards Institute ─ an independent, non-profit organization that establishes global standards for telecommunications, broadcasting and other electronic communication networks and services. ETSI is a key channel through which the 3GPP organization submits contributions for 5G requirements. Membership is comprised of over 800 organizations from more than 60 countries across five continents. As a member of ETSI, Skyworks is actively participating in the development of 5G standards critical to ensuring interoperability among systems and networks, compliance with legislation, security, and other needs of the industry. Skyworks is also a key contributor to the 3GPP body for Radio Access Network (RAN4) technical specifications. To learn more about our suite of 5G solutions, please visit Sky5™. Skyworks Solutions, Inc. is empowering the wireless networking revolution. Our highly innovative analog semiconductors are connecting people, places and things spanning a number of new and previously unimagined applications within the automotive, broadband, cellular infrastructure, connected home, industrial, medical, military, smartphone, tablet and wearable markets. Skyworks is a global company with engineering, marketing, operations, sales and support facilities located throughout Asia, Europe and North America and is a member of the S&P 500 and Nasdaq-100 market indices.